The structure of a long bone allows for the best visualization of all of the parts of a bone ([link]). A long bone has two parts: the diaphysis and the epiphysis. The diaphysis is the tubular shaft that runs between the proximal and distal ends of the bone. The hollow region in the diaphysis is called the medullary cavity, which is filled with yellow marrow. The walls of the diaphysis are composed of dense and hard compact bone. The medullary cavity has a delicate membranous lining called the endosteum (end- = “inside”; oste- = “bone”), where bone growth, repair, and remodeling occur. The outer surface of the bone is covered with a fibrous membrane called the periosteum (peri- = “around” or “surrounding”). The periosteum contains blood vessels, nerves, and lymphatic vessels that nourish compact bone. Tendons and ligaments also attach to bones at the periosteum. The periosteum covers the entire outer surface except where the epiphyses meet other bones to form joints ([link]). In this region, the epiphyses are covered with articular cartilage, a thin layer of cartilage that reduces friction and acts as a shock absorber. Flat bones, like those of the cranium, consist of a layer of diploë (spongy bone), lined on either side by a layer of compact bone ([link]). The two layers of compact bone and the interior spongy bone work together to protect the internal organs. If the outer layer of a cranial bone fractures, the brain is still protected by the intact inner layer. The surface features of bones vary considerably, depending on the function and location in the body. [link] describes the bone markings, which are illustrated in ([link]). There are three general classes of bone markings: (1) articulations, (2) projections, and (3) holes. As the name implies, an articulation is where two bone surfaces come together (articulus = “joint”). These surfaces tend to conform to one another, such as one being rounded and the other cupped, to facilitate the function of the articulation. A projection is an area of a bone that projects above the surface of the bone. These are the attachment points for tendons and ligaments. In general, their size and shape is an indication of the forces exerted through the attachment to the bone. A hole is an opening or groove in the bone that allows blood vessels and nerves to enter the bone. As with the other markings, their size and shape reflect the size of the vessels and nerves that penetrate the bone at these points. The surface features of bones depend on their function, location, attachment of ligaments and tendons, or the penetration of blood vessels and nerves. Bone contains a relatively small number of cells entrenched in a matrix of collagen fibers that provide a surface for inorganic salt crystals to adhere. These salt crystals form when calcium phosphate and calcium carbonate combine to create hydroxyapatite, which incorporates other inorganic salts like magnesium hydroxide, fluoride, and sulfate as it crystallizes, or calcifies, on the collagen fibers. The hydroxyapatite crystals give bones their hardness and strength, while the collagen fibers give them flexibility so that they are not brittle. Although bone cells compose a small amount of the bone volume, they are crucial to the function of bones. 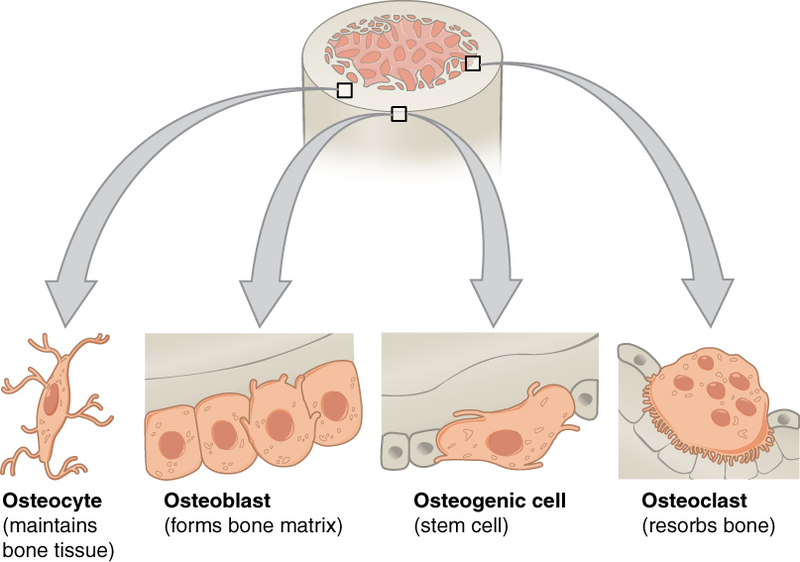 Four types of cells are found within bone tissue: osteoblasts, osteocytes, osteogenic cells, and osteoclasts ([link]). Four types of cells are found within bone tissue. Osteogenic cells are undifferentiated and develop into osteoblasts. When osteoblasts get trapped within the calcified matrix, their structure and function changes, and they become osteocytes. Osteoclasts develop from monocytes and macrophages and differ in appearance from other bone cells. The osteoblast is the bone cell responsible for forming new bone and is found in the growing portions of bone, including the periosteum and endosteum. Osteoblasts, which do not divide, synthesize and secrete the collagen matrix and calcium salts. 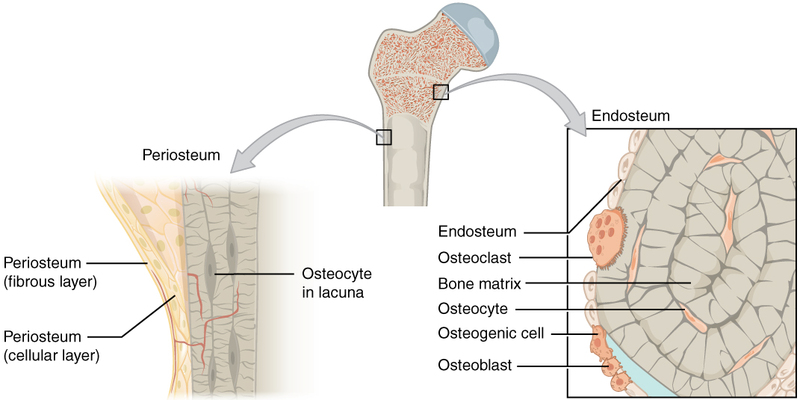 As the secreted matrix surrounding the osteoblast calcifies, the osteoblast become trapped within it; as a result, it changes in structure and becomes an osteocyte, the primary cell of mature bone and the most common type of bone cell. Each osteocyte is located in a space called a lacuna and is surrounded by bone tissue. Osteocytes maintain the mineral concentration of the matrix via the secretion of enzymes. Like osteoblasts, osteocytes lack mitotic activity. They can communicate with each other and receive nutrients via long cytoplasmic processes that extend through canaliculi (singular = canaliculus), channels within the bone matrix. If osteoblasts and osteocytes are incapable of mitosis, then how are they replenished when old ones die? The answer lies in the properties of a third category of bone cells—the osteogenic cell. These osteogenic cells are undifferentiated with high mitotic activity and they are the only bone cells that divide. Immature osteogenic cells are found in the deep layers of the periosteum and the marrow. They differentiate and develop into osteoblasts. The dynamic nature of bone means that new tissue is constantly formed, and old, injured, or unnecessary bone is dissolved for repair or for calcium release. The cell responsible for bone resorption, or breakdown, is the osteoclast. They are found on bone surfaces, are multinucleated, and originate from monocytes and macrophages, two types of white blood cells, not from osteogenic cells. Osteoclasts are continually breaking down old bone while osteoblasts are continually forming new bone. The ongoing balance between osteoblasts and osteoclasts is responsible for the constant but subtle reshaping of bone. 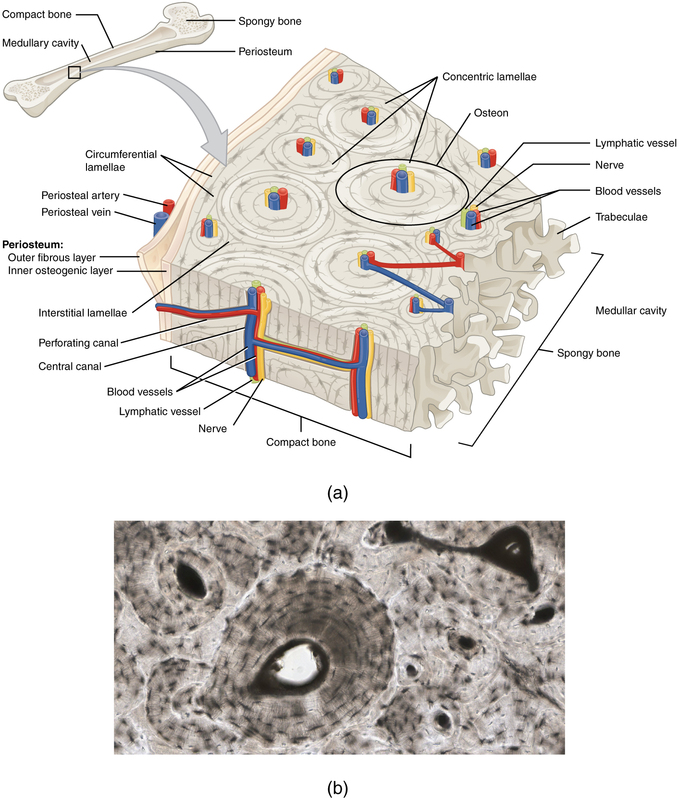 [link] reviews the bone cells, their functions, and locations. Compact bone is the denser, stronger of the two types of bone tissue ([link]). It can be found under the periosteum and in the diaphyses of long bones, where it provides support and protection. The microscopic structural unit of compact bone is called an osteon, or Haversian system. Each osteon is composed of concentric rings of calcified matrix called lamellae (singular = lamella). Running down the center of each osteon is the central canal, or Haversian canal, which contains blood vessels, nerves, and lymphatic vessels. These vessels and nerves branch off at right angles through a perforating canal, also known as Volkmann’s canals, to extend to the periosteum and endosteum. The osteocytes are located inside spaces called lacunae (singular = lacuna), found at the borders of adjacent lamellae. As described earlier, canaliculi connect with the canaliculi of other lacunae and eventually with the central canal. This system allows nutrients to be transported to the osteocytes and wastes to be removed from them. Like compact bone, spongy bone, also known as cancellous bone, contains osteocytes housed in lacunae, but they are not arranged in concentric circles. Instead, the lacunae and osteocytes are found in a lattice-like network of matrix spikes called trabeculae (singular = trabecula) ([link]). The trabeculae may appear to be a random network, but each trabecula forms along lines of stress to provide strength to the bone. The spaces of the trabeculated network provide balance to the dense and heavy compact bone by making bones lighter so that muscles can move them more easily. In addition, the spaces in some spongy bones contain red marrow, protected by the trabeculae, where hematopoiesis occurs. Spongy bone is composed of trabeculae that contain the osteocytes. Red marrow fills the spaces in some bones. Skeletal System: Paget’s Disease Paget’s disease usually occurs in adults over age 40. It is a disorder of the bone remodeling process that begins with overactive osteoclasts. This means more bone is resorbed than is laid down. The osteoblasts try to compensate but the new bone they lay down is weak and brittle and therefore prone to fracture. While some people with Paget’s disease have no symptoms, others experience pain, bone fractures, and bone deformities ([link]). Bones of the pelvis, skull, spine, and legs are the most commonly affected. When occurring in the skull, Paget’s disease can cause headaches and hearing loss. 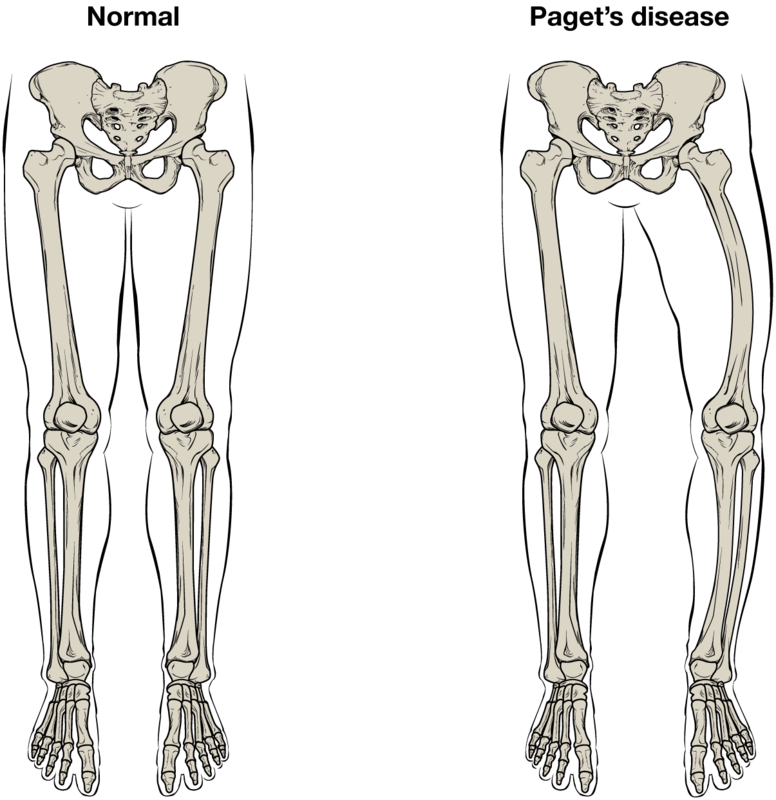 Normal leg bones are relatively straight, but those affected by Paget’s disease are porous and curved. What causes the osteoclasts to become overactive? The answer is still unknown, but hereditary factors seem to play a role. Some scientists believe Paget’s disease is due to an as-yet-unidentified virus. Paget’s disease is diagnosed via imaging studies and lab tests. X-rays may show bone deformities or areas of bone resorption. Bone scans are also useful. In these studies, a dye containing a radioactive ion is injected into the body. Areas of bone resorption have an affinity for the ion, so they will light up on the scan if the ions are absorbed. In addition, blood levels of an enzyme called alkaline phosphatase are typically elevated in people with Paget’s disease. Bisphosphonates, drugs that decrease the activity of osteoclasts, are often used in the treatment of Paget’s disease. However, in a small percentage of cases, bisphosphonates themselves have been linked to an increased risk of fractures because the old bone that is left after bisphosphonates are administered becomes worn out and brittle. Still, most doctors feel that the benefits of bisphosphonates more than outweigh the risk; the medical professional has to weigh the benefits and risks on a case-by-case basis. Bisphosphonate treatment can reduce the overall risk of deformities or fractures, which in turn reduces the risk of surgical repair and its associated risks and complications. The spongy bone and medullary cavity receive nourishment from arteries that pass through the compact bone. The arteries enter through the nutrient foramen (plural = foramina), small openings in the diaphysis ([link]). 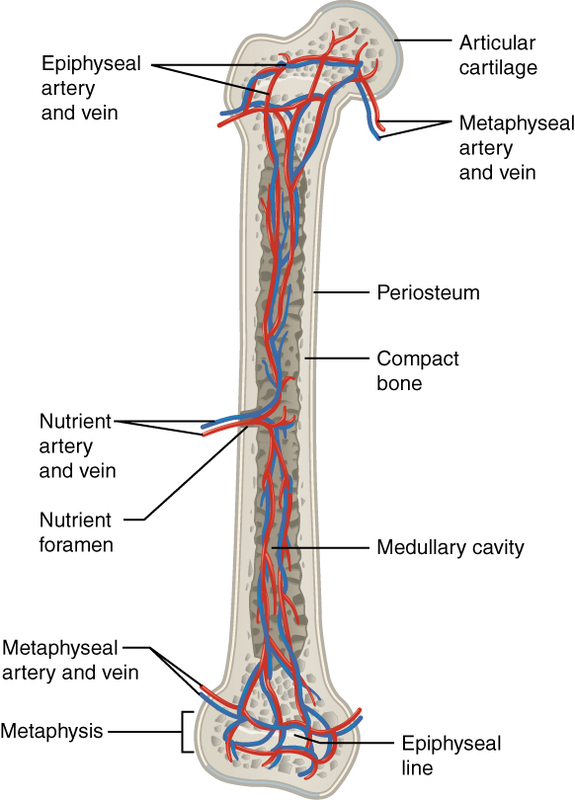 The osteocytes in spongy bone are nourished by blood vessels of the periosteum that penetrate spongy bone and blood that circulates in the marrow cavities. As the blood passes through the marrow cavities, it is collected by veins, which then pass out of the bone through the foramina. In addition to the blood vessels, nerves follow the same paths into the bone where they tend to concentrate in the more metabolically active regions of the bone. The nerves sense pain, and it appears the nerves also play roles in regulating blood supplies and in bone growth, hence their concentrations in metabolically active sites of the bone. Blood vessels and nerves enter the bone through the nutrient foramen. Watch this video to see the microscopic features of a bone. 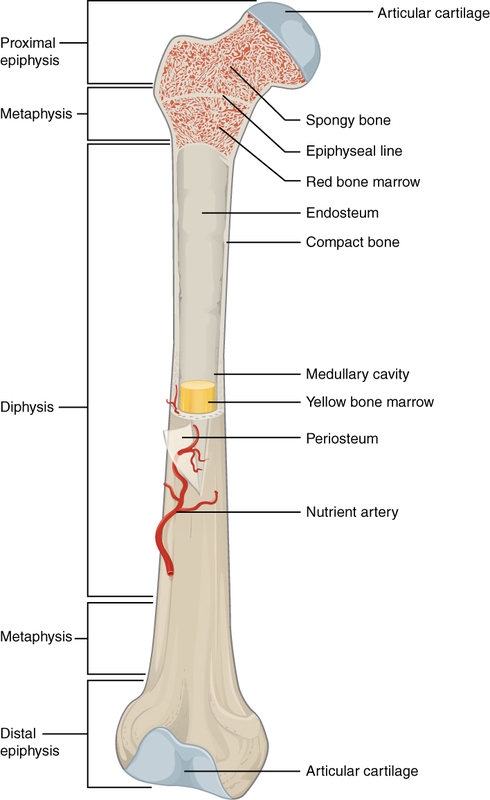 A hollow medullary cavity filled with yellow marrow runs the length of the diaphysis of a long bone. The walls of the diaphysis are compact bone. The epiphyses, which are wider sections at each end of a long bone, are filled with spongy bone and red marrow. 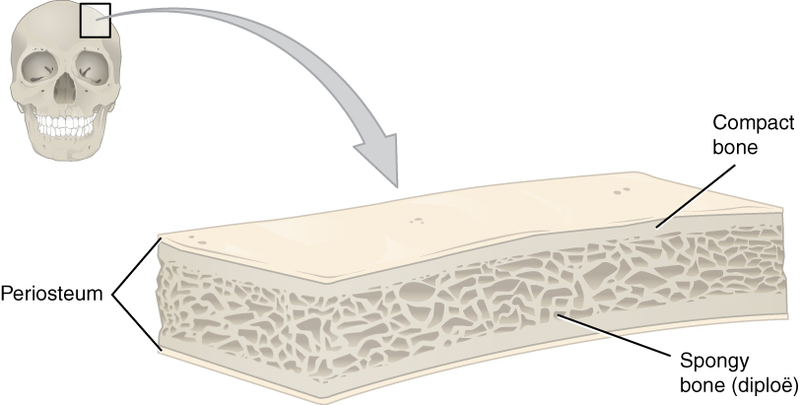 The epiphyseal plate, a layer of hyaline cartilage, is replaced by osseous tissue as the organ grows in length. The medullary cavity has a delicate membranous lining called the endosteum. The outer surface of bone, except in regions covered with articular cartilage, is covered with a fibrous membrane called the periosteum. Flat bones consist of two layers of compact bone surrounding a layer of spongy bone. Bone markings depend on the function and location of bones. 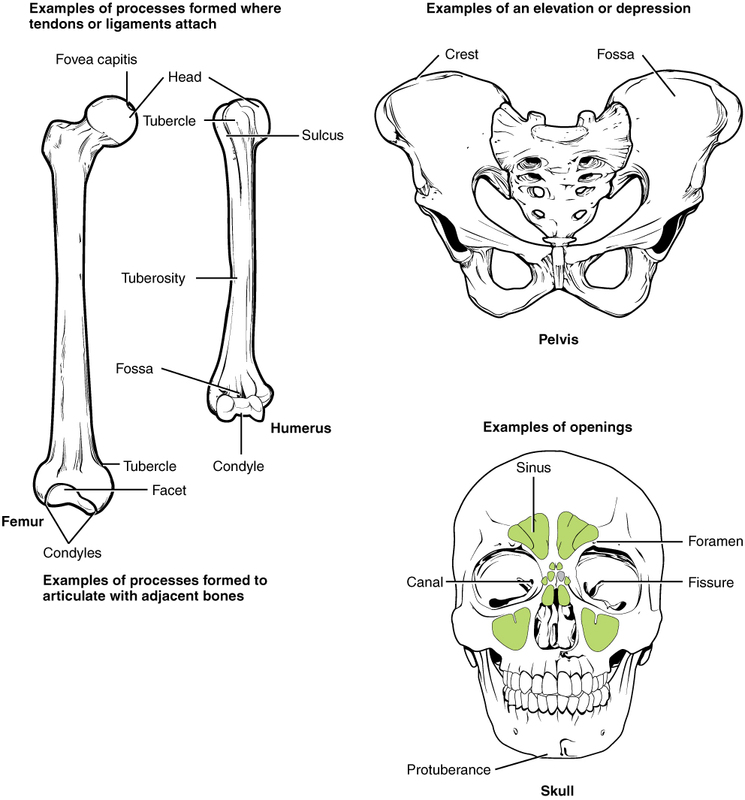 Articulations are places where two bones meet. Projections stick out from the surface of the bone and provide attachment points for tendons and ligaments. Holes are openings or depressions in the bones. Bone matrix consists of collagen fibers and organic ground substance, primarily hydroxyapatite formed from calcium salts. Osteogenic cells develop into osteoblasts. Osteoblasts are cells that make new bone. They become osteocytes, the cells of mature bone, when they get trapped in the matrix. Osteoclasts engage in bone resorption. Compact bone is dense and composed of osteons, while spongy bone is less dense and made up of trabeculae. Blood vessels and nerves enter the bone through the nutrient foramina to nourish and innervate bones. Which of the following occurs in the spongy bone of the epiphysis? The fibrous membrane covering the outer surface of the bone is the ________. Which of the following are incapable of undergoing mitosis? Which cells do not originate from osteogenic cells? Which of the following are found in compact bone and cancellous bone? The area of a bone where the nutrient foramen passes forms what kind of bone marking? If the articular cartilage at the end of one of your long bones were to degenerate, what symptoms do you think you would experience? Why? If the articular cartilage at the end of one of your long bones were to deteriorate, which is actually what happens in osteoarthritis, you would experience joint pain at the end of that bone and limitation of motion at that joint because there would be no cartilage to reduce friction between adjacent bones and there would be no cartilage to act as a shock absorber. In what ways is the structural makeup of compact and spongy bone well suited to their respective functions? The densely packed concentric rings of matrix in compact bone are ideal for resisting compressive forces, which is the function of compact bone. 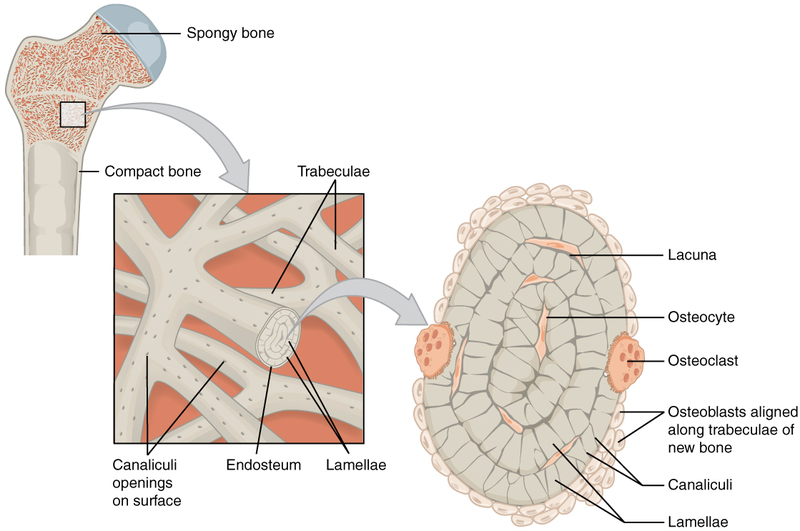 The open spaces of the trabeculated network of spongy bone allow spongy bone to support shifts in weight distribution, which is the function of spongy bone.